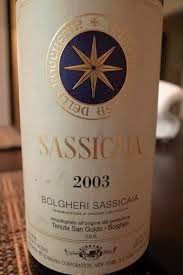 Sassicaia. I've had this Bordeaux style wine from the Tuscany region in Italy on three occasions. Twice on Norwegian Cruise lines, where I did not note the vintage we enjoyed, and once at home we had a 2008 that I ordered from Ultimate Wine Shop, and paid about $160. Compared to Napa Valley Cabernet Sauvignon wines I was used to, the silky softness of the finish on this wine, accompanied by wonderful red fruit flavors - was phenomenal. 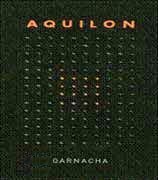 2008 Bodegas Alto Moncayo Aquilon. This Garnacha (Grenache) based wine from the Campo de Borja wine region in Spain. Alto Moncayo makes some of my very favorite wine, and this is their flagship offering. The intensity of the fruit flavor, and the chocolately, smoky aromas are definitely unforgettable. I purchased this bottle at Total Wine & More for about $120. Back before I had ever attended my first wine tasting on my path to wine geekdom where I now reside, I was on a business trip for my job as an IT Project Manager. There were several of us who had travelled to the company's headquarters, and work was going into the evening hours. One of the guys in our group (the sales guy who had a huge stake in what we were doing, but couldn't contribute much) headed out to a local grocery store and brought back some red wine. Up to this point I mostly detested red wine (I can't tell you how hard that phrase is to type now, but I just remind myself I am reminiscing! ), but lacking any other options had a glass. Hey... it wasn't too bad - in fact pretty enjoyable. It wasn't one of the moments that led me to become serious about wine, but it was a moment in my wine history that I remember. Which wine you ask? 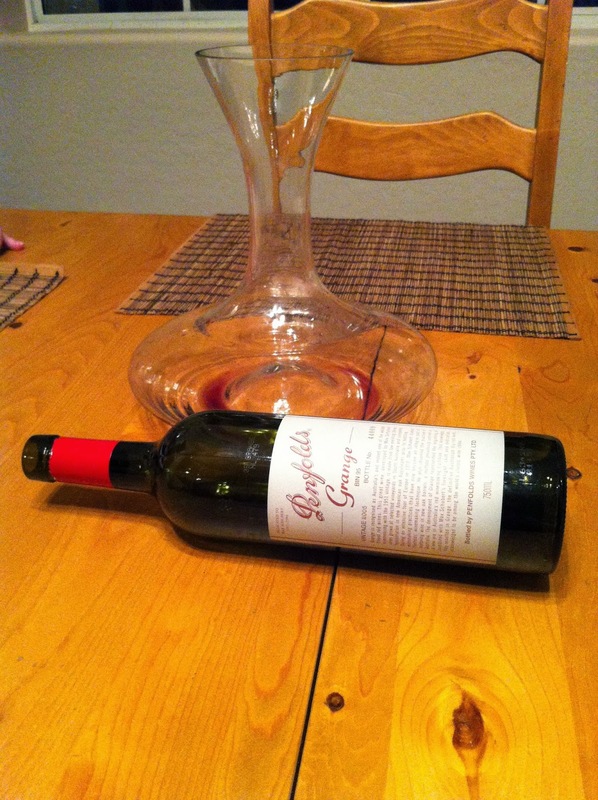 It was a Rosemount Diamond Series Shiraz from Australia. Now the stuff sells for less than $10 a bottle, back then it was likely close to $5 a bottle. 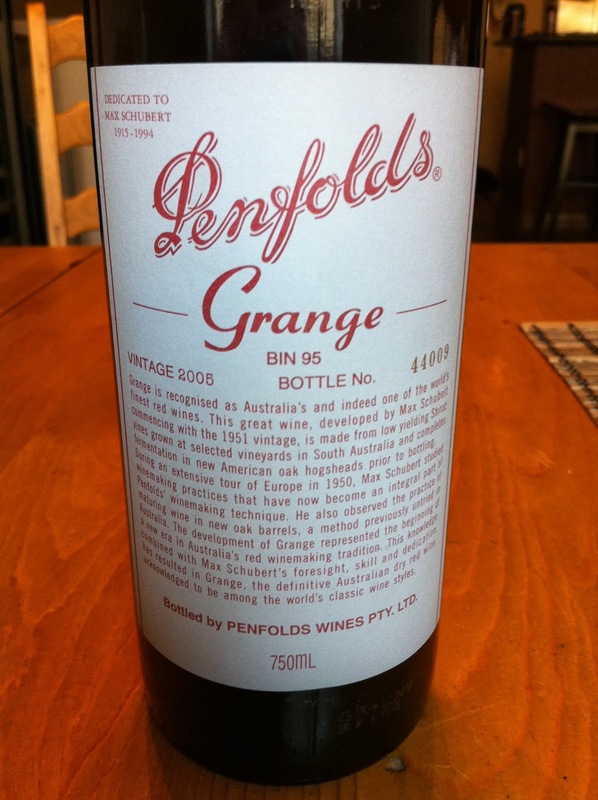 Once I got into wine, and became a regular reader of Wine Spectator, I noted in their Top Ten wines of 2003 that #6 was a 2000 Shiraz from Penfolds called "RWT" (later I learned this acronym stood for Red Wine Trials). I was at the point I was ready to try and enjoy a bottle of $70 wine, so bought it and absolutely loved it. In fact, it held the crown as my favorite Shiraz until I found a Napa winery called Darioush... but I digress. 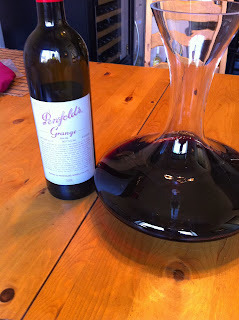 In reading to learn more about Penfolds, I read a about their big daddy wine - Grange. This wine typically releases around $200, and the price tends to increase based upon the score the particular vintage received (which is almost always 90+, and routinely 95+ according to Wine Spectator). I was fascinated how much better a wine could taste than the RWT that I thoroughly enjoyed. Could it really taste 3 times as good to justify the price. At that point I added my first wine related bucket list item - someday I wanted to try a Penfolds Grange. It's now 2013, and I decide that for my Birthday present this year - I wanted to realize the dream and try a Penfolds Grange. I did some research on the vintages available, and found that the 2008 had received a perfect 100 points from Wine Spectator, and had a $850 price tag to go along with that honor. That was too much for my budget, so instead I opted for the 2005. At $450 it was a relative bargain, plus at 97 points (Wine Spectator) it likely was no slouch, plus the drinking window was estimated to start in 2014 - so it was (close enough to) ready to drink. I do know that this is not a small amount to throw down on one bottle - it costs more than my two previous all time favorite wines combined. I have wanted to try this wine for so many years, and finally answer the question - "How much better can a wine be than ones you've already tried?" Is the price due to rarity, fame, etc? It is a really good wine with a really really high price? Only one way to know for sure. I visited my local Total Wine & More, and looking for wine value even when buying an OMG bucket list level wine, I also bought 5 bottles of everyday wine to take advantage of their "pick six" deal where you get 10% 6 bottles. 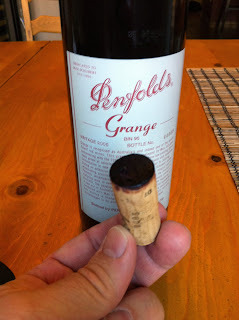 I wasn't sure if the Grange qualified - but it did! So with the discounts I basically got the other 5 bottles for free! I have never been so nervous as I cradled my box of wine walking across the parking lot - having terrible visions of tripping and staining the asphalt with $500 of fermented grape juice. Luckily, the I made it all the way home safely with my prize - a thing of beauty! 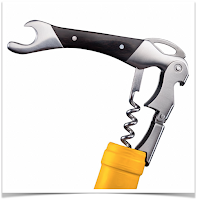 If you are a regular reader of this blog, you will know I am a big fan of wine aeration, and often use a Vinturi aerator. 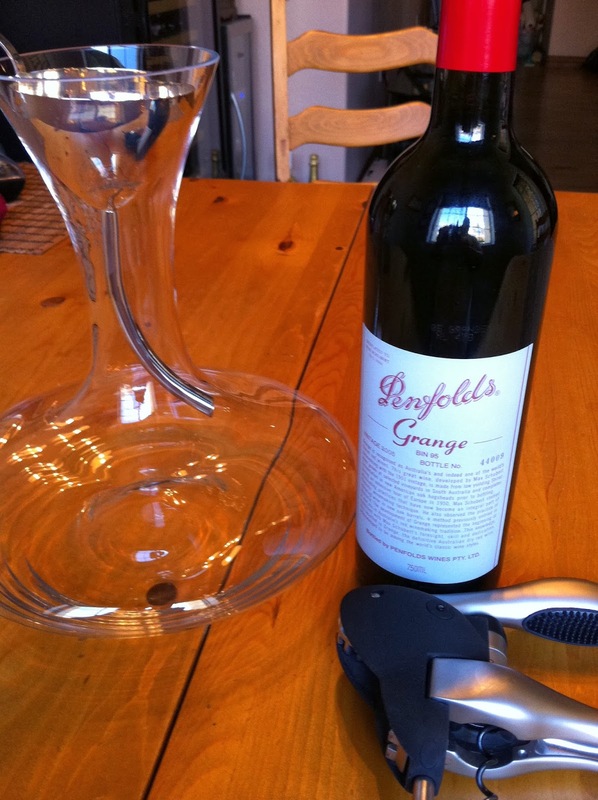 However, no short cuts to aeration for this baby - nothing but old fashioned decanting. We were having dinner at about 8p, so I gathered my gear before noon so I could open and decant the wine for at least 8 hours before serving. 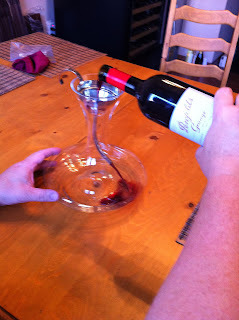 My gear included a good wine opener, a decanter, and a decanter funnel with a filter to capture any sediment. At this point, my next set of fears arrived - what if the cork is damaged, or what if the bottle is one unlucky enough to be impacted by cork taint. How easy will it be to take a bottle of this price back - already opened, for a trade in?? 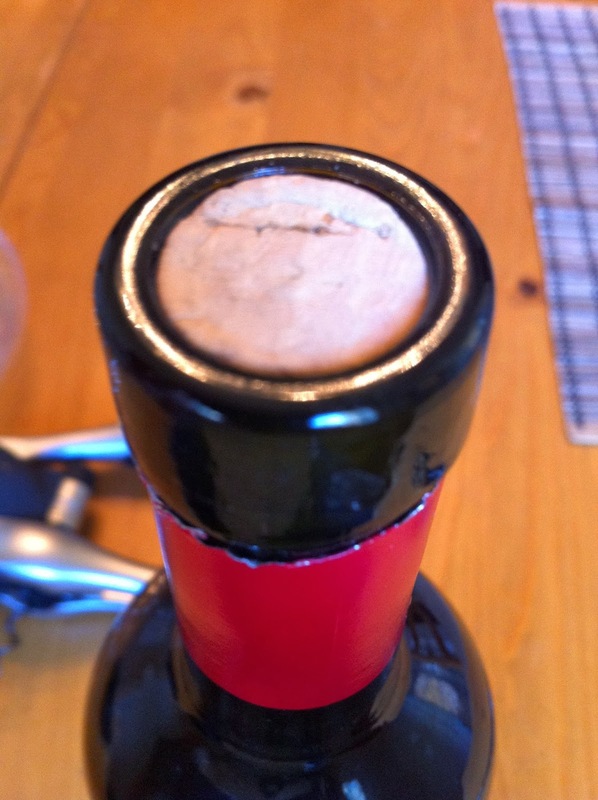 Luckily, I did not need to find out - as the cork was in beautiful condition. The bottom of the cork that was in contact with the wine was nearly black - this was going to have some concentration to it! A quick smell of the bottle gave nothing but intense fruit, chocolate, and smoke (as in smoked meat) ... whew! Cork Out - No Turning Back Now! Next, I poured into the decanter - through the funnel and filter to begin Mr. Grange's long day of relaxing and aerating. There was just a bit of sediment captured, and I left about 1 Tablespoon of wine in the bottle one sediment started to appear. A crime I know, but superfine sediment in the remnants of the wine could add extra unwanted bitterness - better to leave it out. Welcome to the World Mr. Grange! Now I found a comfortable spot - away from direct sun for the wine to breath for about eight hours. 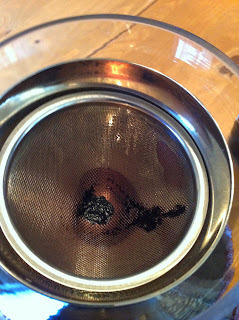 Every hour or so I would swirl and check the aromas to make sure all was good. A wine like this deserves a special delivery mechanism, so I grabbed my Riedel Vinum Extreme Caberent Sauvignon glasses. 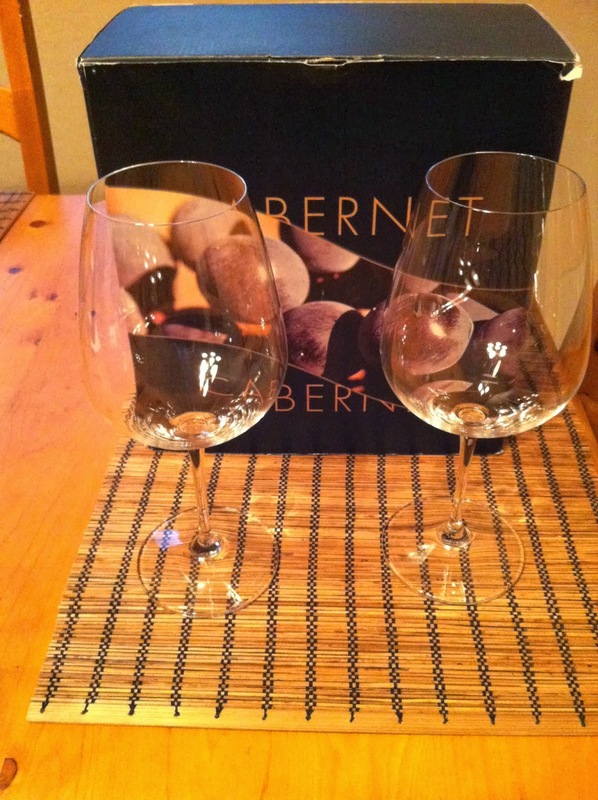 Super thin crystal, and just a beautiful glass for a special wine. Wine glass foul for serving an Australian Shiraz in a Cabernet Sauvignon glass - but I only have these or Vinum Extreme Pinot Noir glasses. 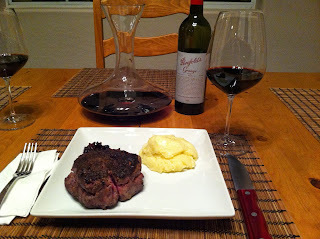 To accompany this epic wine, I wanted to have the right meal. I read a lot about Lamb and Shiraz being a classic combo, but instead decided to go with a Rib Eye, bought in Scottsdale at Bull Market - a real live and actual butcher shop! The quality of their products is incredible, they will definitely be my special occasion meat shop going forward. I encrusted the steak with powdered dry porcini mushrooms to add some earthiness, and made a blueberry, bacon, port, and tarragon sauce to add some strength to the dish so it would stand up against a monster wine. Add a side of Joël Robuchon inspired potato puree, and we are ready to dine! Since the wine had been sitting out all day - I put the decanter into the refrigerator for about 12-15 minutes before dinner to get the wine down to a good serving temperature. If you decant for extended periods of time, don't forget to cool the wine down to close to 60 degrees Fahrenheit to coax the most enjoyable aromas and flavors from your wine. Before we dug in to enjoy the food we'd prepared, Wino4Life wife and I first focused on the wine. The aromas were deep and complex - blackberry, cherry, coffee, chocolate, smoked meat, baking spices - all perfectly balanced and existing in wonderful harmony. A long time in the planning - the time was here for a taste... No other word can describe the taste of this wine than... EPIC!!! The intense fruit flavor was nicely balanced against silky smooth tannins. Usually wine taste dissipates very quickly, but with this wine is was likely drinking a second drink right after the first, the finish hangs in there so long - and is so wonderful, I have never experienced anything like it. I have been lucky enough to try some wonderful wines in my life - but none come close to this one! I let the finish completely dissipate (I don't know how long it took - but it was a looooooooong finish), and took another sip, taking time to thoroughly work it around in my mouth. Just like the first taste, but accentuated by holding it a bit in my mouth - incredible. Even as I write this blog post I am having fond flashbacks of this incredible wine. My wife and I discussed the 2008 vintage - which was rated 3 points higher by Wine Spectator, and would cost $400 more... is there any way a wine could taste much better than what we just had. I had hoped for a good experience, and mostly did not want to be disappointed in a wine that I dropped a big chunk of change to procure. This wine exceeded all my expectations times 1,000. My wife and I pledged to find and drink a new all time favorite wine at least every 5 years or so, (more often if we win the lottery). I better end this post now, I have less than 5 years to find something better than this wine... TOO MUCH PRESSURE!!! Earlier in this post I mentioned the question "How much better can a wine be than ones you've already tried?" To my surprise the answer is - much much better. My prior two all time favorites are no slouches - but (also to my surprise) I fully believe this wine is worth the money. The meal we prepared paired nicely with the wine. The interaction of the blueberry port sauce with the wine was outstanding. I picked it because of the flavor profile I knew of Shiraz, which can have blueberry, raw bacon, and licorice notes - which I saw echoed in the sauces ingredients (with Tarragon and its anise characteristics standing in for licorice). We savored every sip and every bit, but alas eventually there were nothing but memories... really, really, really great memories!!! Hello so you really recommend eight hours decanting? 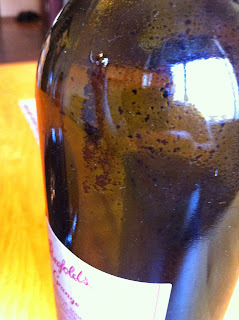 I have found that for wines that can age for many years it is best to decant for a longer period. 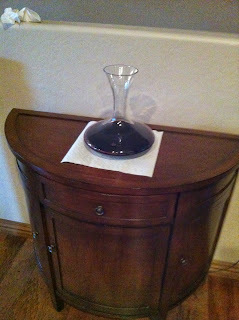 I have been disappointed in some wines such as Cabernet Sauvignon from Napa, California that I opened and served immediately or decanted for only an hour or so. The longer decant allows the aromas and flavors to develop. Since I live in a hotter climate, I put the decanter in the refrigerator for the last 15 or so minutes to cool the wine down to a good serving temperature - and have enjoyed the results very much!